Note to readers of this page – this is a work in progress. We are accumulating a list of events and will subsequently build the timeline. Your suggestions of events to be included would be greatly appreciated. 1. Sales of AIG units AIA and ALICo. 2. Movement on Financial regulation overhaul. 3. Proliferation on books on the crisis: e.g., Too Big To Fail; Fool’s Gold; 13 Banks. 5. Repayment of TARP money by the various recipients. 6. Incredible first Q profits of banks. Referendum in Iceland in March which rejected government proposal to repay British and Dutch governments for losses incurred by their citizens depositing monies with failed Icelandic banks. Irish government creation of NAMA, a bad bank which will work out troubled loan assets – most interesting dimension is valuation basis on which these are transferred from banks to NAMA. * 8 Dec.: Fitch Ratings cuts Greece’s rating to BBB+ from A-, with a negative outlook. * 14 Dec.: Greek PM Papandreou outlines first round of policies to cut deficit and regain investor trust. * 16 Dec.: S&P cuts Greece’s rating to BBB+ from A-. * 22 Dec.: Moody’s cuts Greece’s rating to A2 from A1. 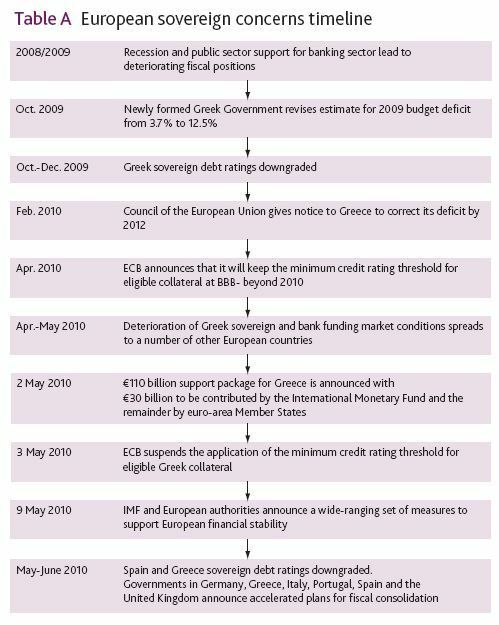 * 14 Jan.: Greece unveils the Stability and Growth Program which aims to cut deficit from 12.7% in 2009 to 2.8% in 2012. * 2 Feb.: Government extends public sector wage freeze to those earning less than EUR 2,000 a month. * 3 Feb.: EU Commission backs Greece’s Stability and Growth Program and urges it to cut its overall wage bill. * 24 Feb.: One-day general strike against the austerity measures halts public services and transport system. * 25 Feb.: EU mission in Athens with IMF experts delivers grim assessment of country’s finances. * 5 Mar. : New public sector wage cuts and tax increases is passed and estimated to generate savings of EUR 4.8 bn. Measures include increasing VAT by 2% to 21%, cutting public sector salary bonuses by 30%, increases on fuel, tobacco and alcohol consumption taxes and freezing state-funded pensions in 2010. * 11 Mar. : Public and private sector workers strike. * 15 Mar. : EMU finance ministers agree on mechanism to help Greece but reveal no details. * 25 Mar. : ECB President Jean-Claude Trichet says his bank will extend softer rules on collateral (accepting BBB? instead of the standard A-) for longer (up to 2011) in order to avoid a situation where one ratings agency (Moody’s) basically decides if an EMU country’s bonds are eligible for use as ECB collateral. * Mar. : €5bn in 10-year Greek bonds sold – orders for three times that amount are received. * 9 Apr. : Greek government announces that the deficit for the first trimester was reduced by 39,2%. The news fails to impact the market, since it is ignored by the main financial media. * 11 Apr. : EMU leaders agree bailout plan for Greece. Terms are announced for EUR 30 bn of bilateral loans (roughly 5% for a three-year loan). EMU countries will participate in the amount based on their ECB country keys. Rates for variable rate loans will be 3m-Euribor plus 300 bp + 100 bp for over three-year loans plus a one-off 50 bp charge for operating expenses. For fixed rate loans rates will be swap rate for the loan’s maturity, plus the 300 bp (as in variable) plus the 100 bp for loans over three years plus the 50 bp charge. * 15 Apr. : Olli Rehn says there is no possibility of a Greek default and no doubt that Germany will participate in the bail out plan. In the mean time there had been serious objections from parts of German society to the country’s participation in the Greek bail-out. * Apr. Sale of more than 1.5 billion euros Greek Treasury bills met with “stronger-than-expected” demand, albeit at a high interest rate. * 23 Apr. : Greece officially asks for the disbursement of money from the aid package effectively activating it. * 27 Apr. : Standard and Poor’s downgrades Greece’s debt ratings below investment grade to junk bond status. * 27 Apr. : S&P downgrades Portuguese debt two notches and issues negative outlook, warning that further downgrades to junk status are likely. Stock indices around the world drop two to six percent on the news. * 2 May: Greece announces the latest, fourth, raft of austerity measures. * 3 May: The ECB announces that it will accept Greek Government Bonds as collateral no matter what their rating is. This effectively means scrapping the BBB-floor in the case of Greece and increasing the likelihood of similar announcements in case other countries run the risk of being downgraded to junk status. * 4 May: First day of strikes against the austerity measures. Global stock markets react negatively to fears of contagion. * 5 May: General nationwide strike and demonstrations in two major cities in Greece turned violent. Three people were killed when a group of masked people threw petrol bombs in a Marfin Bank branch on Stadiou street. * 6 May: Concerns about the ability of the Eurozone to deal with a spreading crisis effectively caused a severe market sell off, particularly in the US where electronic trading glitches combined with a high volume sell off produced a nearly 1,000 point intra-day drop in the Dow Jones Industrial Average, before it recovered somewhat to close down 347. * 7 May: Volatility continued to accelerate with an increasing CBOE VIX index and a major widening in currency spreads, particularly dollar-yen and dollar-euro. May 10 – Europe Central Bank announces Trillion dollar fund to support European sovereigns, especially Greece.